I started cutting wood in July. I woke up one cool morning after the heat broke, and went out in the woods and started cutting. This might be the year I have all my wood cut before the snow flies. I only cut dead trees which are down. If you don’t cut and split the wood, it will start to rot. Rotting isn’t terrible, as many critters make a living out of decaying trees, but I figure it’s also a good way to heat my house. If I cut into a tree and its started to rot, I leave it for the critters. I bought a new splitting maul, pictured. I don’t know why I scrimped with my old one for so long. This one works like a dream. It’s an eight pound maul made by Task. This entry was posted on Wednesday, August 1st, 2012 at 11:07 am and is filed under Curious farmer, Curious nature. You can follow any responses to this entry through the RSS 2.0 feed. You can leave a response, or trackback from your own site. So, is splitting maul another word for ax? OMGoodness! I didn’t know they came so massive! I love learning a new word at 6 a.m. But you still have to swing it up around and down, splitting the wood, so to speak, eh?! 8 pounds?!! Bet you have no problems carrying groceries in from the car. My hat is off to you. What is done [for not the same exact effect] around LA is go to Yoga class and run up a hill for endorphins. It doesn’t often feel important for existence, but it does help with a semblance of sanity. I like that you save the rotten wood for creatures. Yesterday I awoke, saw something moving behind the olive oil jar. Squeaked only a little, when I realized that it was a mouse dog-paddlin’ for his little life. I immediately walked out in my robe, turned the bottle side-ways and drained it into an empty flower pot. Needless to say, I instructed him to stay ‘outta da’ cottage.’ He found his way out at some point. I just couldn’t do him after all that trauma. Thanks, Karen. I guess a splitting maul would be a type of ax. I’ve tried using a traditional ax and it gets stuck in the log. I think it needs more mass to split open a log. Good story about the mouse. Wonder if he learned his lesson. 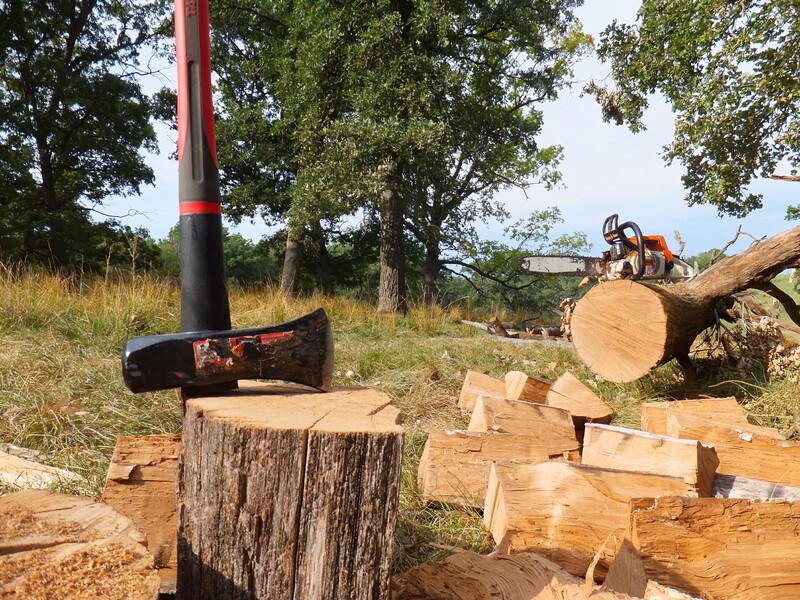 I have a small forest axe and I’ve also split a lot of wood but to be honest it’s not the best tool for the job, especially with wood that is hard to split. Agreed. I’ve never done very well with the narrower axes, preferring the larger, wider splitting maul.